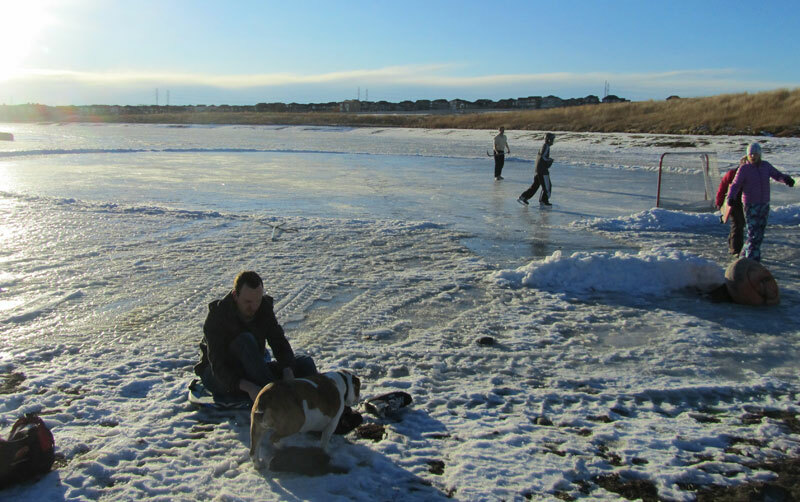 Alas, in spite of recent rumors – Christmas will come to Chestermere and skaters can continue to enjoy the frozen ponds and ice surfaces around town, at their own risk – just as it always has been. After a thorough search of Town Hall, looking under desks, in the lunch rooms, closets and even in council chambers, there was no sign of the Grinch anywhere. As a matter of fact, the beautifully decorated tree still stands in the lobby, the lights are still up and aglow and all the stockings are hung with care. As you might imagine, what can be found in Town Hall this time of year besides the usual dedicated staff is Christmas cheer and festive activities like the upcoming Christmas with Dignity celebration that supports families in need within our community. You may have heard talk through social media or news outlets that dreams of turning frozen storm ponds within our town into outdoor skating surfaces was stolen by town employees and council in a Grinch-like fashion. This rumor was derived from a story that was told by some residents of our town which was based on misinformation and assumptions. Sadly, the story became so grossly misrepresented and filled with drama that the facts quickly became buried underneath 6 inches of ice, tarnishing Chestermere’s reputation. I was present at both council meetings when the proposed “Pond Hockey League” project was discussed, and so I feel a responsibility to share the facts as I know them. 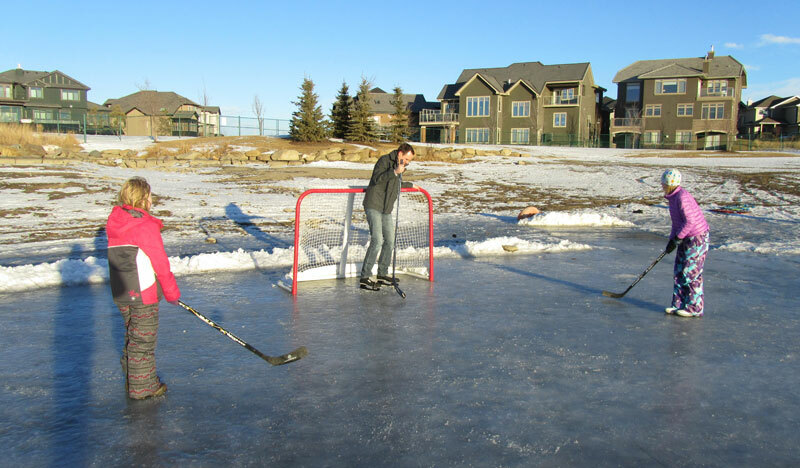 It started with a small group of individuals who wanted to organize an official pond hockey league in Chestermere, to be played on a public storm water pond in Rainbow Falls. The group had plans to erect boards for a hockey rink as well as lights so that the games could go on past dark. The league organizers attended a town council meeting on November. 18 to present their idea to the members of council, asking for a permit to go forward with their plans to have structures to support their rink placed on the pond. Ultimately, as with all appointments of this nature – council asked staff to look further into this proposal and come back to council at the next scheduled meeting with recommendations on how to proceed. The league organizers were advised that a decision would be made, based on staff’s recommendations at the next public meeting to be held December 2. On December 2, at the regular scheduled public council meeting – in front of an empty gallery; with no representation from the pond hockey league organizers, Randy Patrick; Chestermere’s CEO made a presentation to Council in regards to information and recommendations surrounding the pond hockey group and their proposal. It was explained to council that after much research, it was the decision of staff to not issue a permit based on legal advice and the dangers of storm pond use, winter or summer. Patrick went on to describe that storm ponds are designed to take water runoff into them and then slowly release it. The Mayor explains it further, “Some of this run off comes from the road where road salt melts the ice and there are other chemicals from vehicles as well that drain into these ponds. The freeze/thaw cycle from chinooks combined with the fluctuating water levels make the ice inherently unstable.” It was clarified that residents use these ponds at their own risk, as they always have but that the placement of any structure such as boards on a storm pond was prohibited. However, it was also explained by Randy Patrick that many great ideas came from this initiative and he went on to tell about how the town will be looking further into a program run in Calgary called Adopt-a-Rink. This would allow user groups like the pond hockey league to build outdoor rinks on land, which is a much safer alternative. “The idea of an outdoor rink is a great one but is in fact not a new discussion with Council and staff. Other groups have brought this up with staff over the past year and one is ready to try a pilot project with an Adopt-A-Rink program that staff is exploring. This group is looking for a permanent home for an outdoor rink but wants to try out the concept first. Safety is always the first priority so obviously none of these locations are on storm ponds”, says Mayor Matthews. Unfortunately, because there was no representation from the pond hockey league at the December 2 meeting where this information was shared – the opportunity was missed for them hear firsthand the discussions needed to understand why these decisions were made. Instead, it would appear that assumptions were made that the town outright banned all outdoor activity on ice including pond hockey. Ultimately, this false information was shared with members of the community and media causing a lot of anger and confusion. So what does this all mean Chestermere? Well, since you don’t need boards or lights to play pond hockey, I guess it means that everything is just as it always has been. 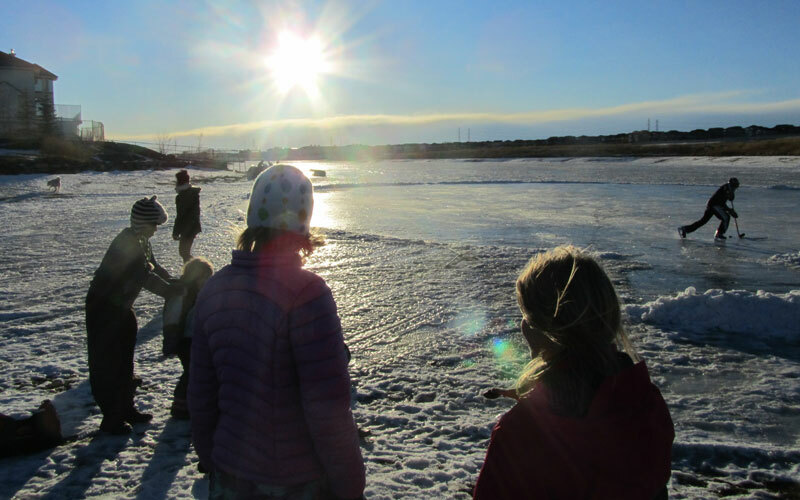 Residents will continue to use their best judgement whether or not they feel it is safe to use the frozen ponds for recreational activities – understanding that they do so at their own risk. In the meantime, we can look forward to the Town continuing to work with community groups much like the pond hockey league to find ways to bring safe, fun outdoor activities such as rinks to our community through new initiatives for everyone to enjoy.